The birdfeeder that assembles in minutes! That's right, minutes! This great wooden bird feeders assembles right out of the box with no nails or glue! In fact other then a couple of minutes, nothing else is required for assembly. Becuse of this, it is a fantastic family project and like all of Greenleaf's products, it made in the USA. Clear plastic window shows the exact seed level. Pattern for painting is included! The Greenleaf Company Store - Photos include a zoom tool so that you can see detail like never before. 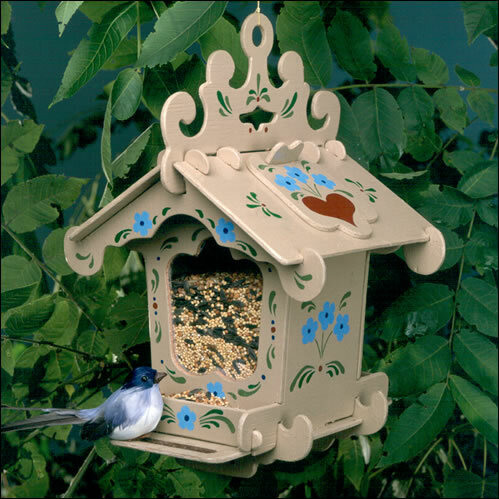 Visit the Black Forest Bird Feeder Kit page to see for yourself! If you have pictures of your Black Forest Bird Feeder that you would like to have considered for viewing from this page, please feel free to post them in the Owners Gallery at the Greenleaf Miniature Community. It's free and it's fun! For more information, please visit our miniature forum for details on how to join! The Greenleaf Forum - The Greenleaf Forum is a wealth of information on not just our dollhouse, but on all things miniature. With advance search features and a friendly member base, you can just read or post a question for peer to peer support. Birdhouse Ownership - Affordable and Fun! The Greenleaf Company Store - Buy factory direct from Greenleaf Dollhouses Company Store! Visit the Black Forest Bird Feeder Kit at our online store for even more info and pictures as well as purchasing information!